SUDBURY – It was a day of celebration, reflection and honoring excellence at Cambrian College’s annual Rendezvous event, held Thursday in the Cambrian Student Life Centre. At Rendezvous, Cambrian honours this year’s group of retiring employees, as well as employees who have reached 5, 10, 15, 20, or 30 years of service. The event also features the President’s Awards for Excellence, recognizing outstanding achievement by employees. This year’s Rendezvous included a special presentation. Richard Fedec received the provincial Art King Award, given annually to a current or retired Ontario college employee for outstanding contributions to student services and support. 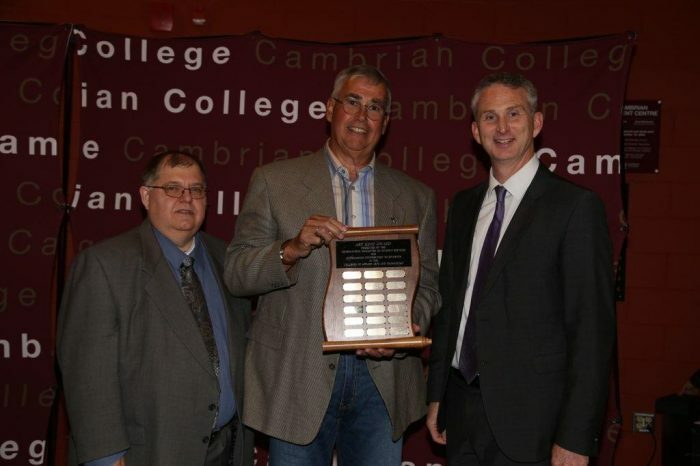 Richard was the Manager of Financial Aid at Cambrian College for 34 years. Over the course of his career, Richard helped thousands of students achieve their dream of a college education by working with them to ensure college was affordable. After his retirement, Richard worked with the Alumni Association and led the 50th anniversary Camaro raffle raising $80,000 for student bursaries. He also established the Richard Fedec Hardship Fund for students. 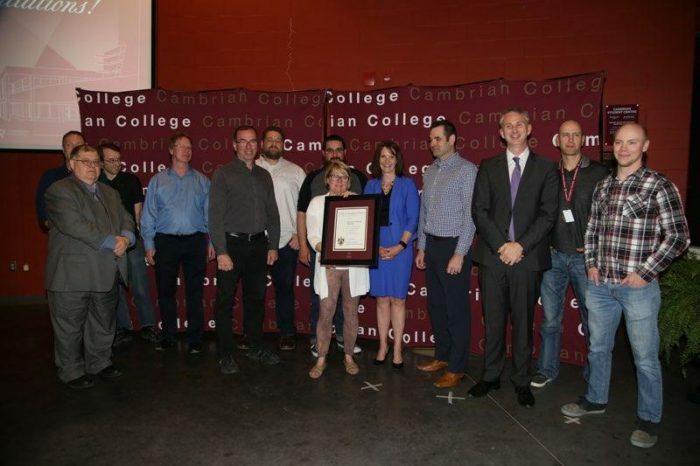 Cambrian College’s IT Team was recognized for exemplary service in recovering from the April 2017 cyber-attack that crippled most of the College’s IT structure. The IT team worked around the clock, seven days a week, restoring labs and classrooms, rebuilding 1,000 computers, resorting in-house databases, web services and corporate applications, and cleansing the entire system. As a result, Cambrian was able to recover services that most organizations would deem impossible. Marie-Ng-Au is a piano instructor in Cambrian’s Academy of Music. She has been described as a teacher who is dedicated to her art, her students and her community. Marie is also a valuable and tireless volunteer, organizing concerts, arranging prizes, and often helping at other teacher’s recitals. Jeff Walker is a professor and coordinator of the Civil Engineering program. Jeff has committed his energy and enthusiasm to the annual Headframe competition, Cambrian’s Outreach initiative and a student employment program. Jeff has also played an important role in developing Cambrian’s relationship with students and professors in Africa, helping to establish a Civil Construction program and coordinating donations of much-need supplies. 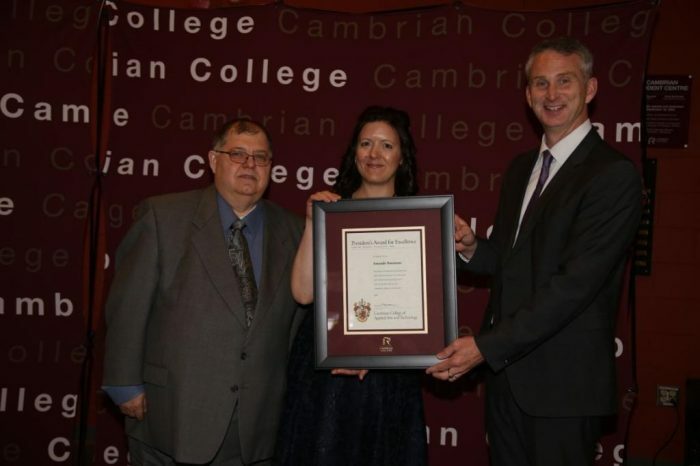 Amanda Simmons is a graduate of Cambrian’s Business Administration program and has been an Admission Specialist at Cambrian College since 2009. Amanda has contributed significantly to the College’s success through her dedication to her role and her commitment to health and wellness both in the College and in the community. This year, Amanda went over and above, sacrificing evenings and weekends so that offers of admission could go out earlier and the College could issue more International letters of admission. 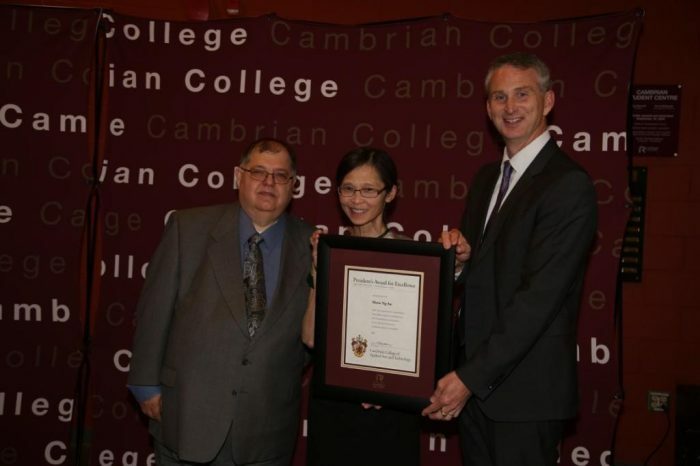 Cambrian College congratulates all the winners of this year’s President’s Awards for Excellence, as well as this year’s retirees and long-serving employees. 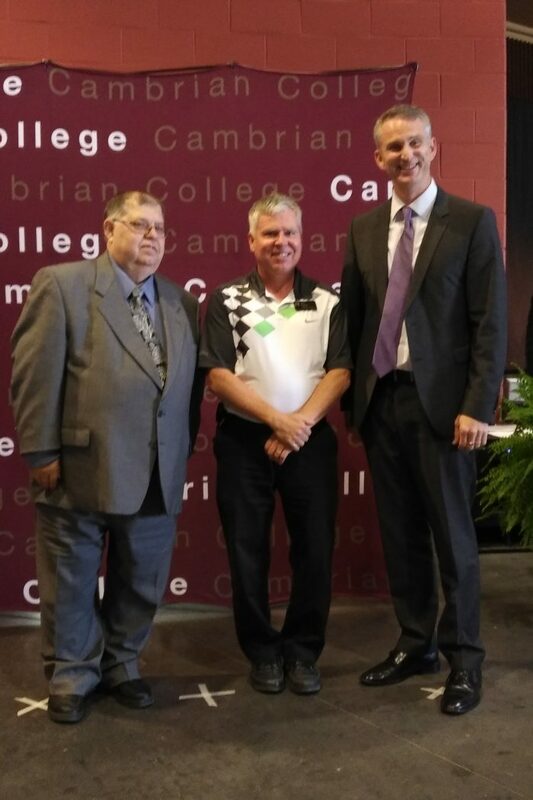 All photos include Glen Retty, Chair, Cambrian College Board of Governors (left), and Bill Best, President of Cambrian College (right).